Providing a comprehensive history of the City University of New York, this book chronicles the evolution of the country’s largest urban university from its inception in 1961 through the tumultuous events and policies that have shaped it character and community over the past fifty years. On April 11, 1961, New York State Governor Nelson Rockefeller signed the law creating the City University of New York (CUNY). This legislation consolidated the operations of seven municipal colleges—four senior colleges (Brooklyn College, City College, Hunter College and Queens College) and three community colleges (Bronx Community College, Queensborough Community College, and Staten Island Community College)—under a common Board of Higher Education. Enrolling at the time approximately 91,000 students, CUNY would evolve over the next fifty years into the largest urban university in the country, serving more than 500,000 students. Reflecting on its uniqueness and broader place in U.S. higher education, Picciano and Jordan examine in depth the development of the CUNY system and all of its constituent colleges, with emphasis on its rapid expansion in the 1960s, and the end of its free tuition in the 1970s, and open admissions policies in the 1990s. 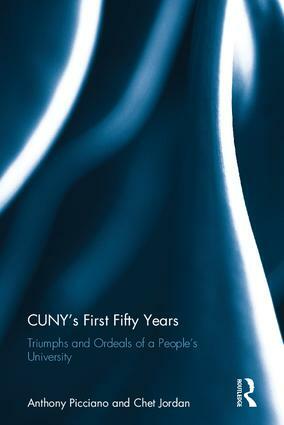 While much of CUNY’s history is marked by twists and turns unique to its locale, many of the issues and experiences at CUNY over the past fifty years shed light on the larger nationwide developments in higher education. "The CUNY story is a great story and the authors tell it well. They pull together the University's evolution and growth, track the benchmark decisions and the major crises, and explore its interactions with politics. Not too much arcane detail and generally enough background to satisfy readers who are not CUNY junkies. Familiar though the story is for me, I still came across things that were new to me. All in all, the authors accomplished much of what they set out to do: a character sketch, with illuminating vignettes of the major players and landmark events along the way." Chapter 5 – The 1970s – Open Admissions, Fiscal Collapse, and Tuition! Anthony G. Picciano is a professor and executive officer of the Ph.D. Program in Urban Education at the City University of New York Graduate Center and Professor of Education Leadership at Hunter College. Chet Jordan is a full-time instructor at Guttman Community College of the City University of New York.